Cute Critter memory/matching game - C loves matching games, and she's been asking for the Easter cards again, so I printed these ones. They had to be small to fit in a little ceramic bowl she loves (I keep catching her lifting it above her head to put it in the 'microwave' in her play kitchen - it's sure to break one of these days!). For bigger cards, the Spring matching cards on Montessori for Everyone are beautiful! This Life Cycle of an Apple matching game goes well with a couple of books we've read recently, and the local apple cider we bought at the grocery store -yum! Not a lot of content here, but it's a cute lift-the-flap book that tells the very basics of apple growing and picking. A straightforward book that shows you how apple cider is made. I enjoyed it more than C; I think older kids would think the process is pretty neat. "Mr. Sun, sun, Mr. Golden Sun, please shine down on me!" This weekend has been beautiful; full of sunshine, laundry blowing in the wind, picnics and playing outside. C and one of her friends went looking for bugs this morning, and they had us grown-ups lift almost every rock in their backyard! We scored by finding a bunch of ants (which they were fascinated by), and a couple of beetles in a compromising situation (now the girls know how baby beetles are made!). Too bad I didn't have a camera with me during the hunt - the girls were so enthralled! 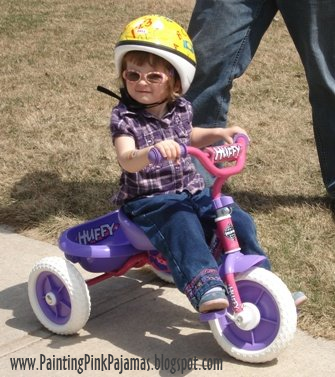 The other big event of the weekend was that we bought C a tricycle! We're happy with the bike, but finding something that didn't have princesses or Dora on it was tricky! The red Radio Flyers were cute, but her legs would be too long for it by next year, so we went with this one. The basket in the back is great! We also got a child carrier for Hubby's bike, and we're going to take a family bike ride tonight. Check out my tattooed biker chick! I added a link in the sidebar for those of you who subscribe to blog feeds. Let me know if you have any trouble with it! Despite the rain, we spent some time outdoors on Earth Day. We went to a local park with some friends, and all the kids enjoyed playing around a small pond and checking out the streams. They enjoyed the "sink or float" game... sometimes a bit too much - many shovels and buckets made it into the water and were saved by the grown-ups! C loved throwing pine cones into the water - she cleared a good sized section of the forest floor! I saved a couple to make pine cone bird feeders that evening. This was the perfect toddler activity, with a bit of a snack thrown in. All we needed was peanut butter, seeds, pine cones and string. Unfortunately, it started raining again shortly after we hung them up outside and it's been raining all day today too, so most of the seeds have probably washed off! It's supposed to be warm and sunny all weekend (25 degrees C! ), so if we re-coat the pinecones, we'll probably get to see some birds munching away! What did your family do? Add your post here. My daughter loves to read; a trait she got from her Mama! We've been reading books for Earth Day, and I thought I'd share some of what we've read so far. 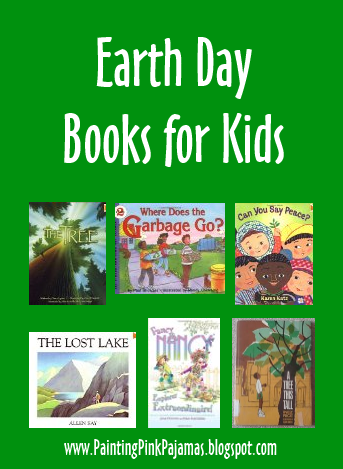 Many of the traditionally recommended Earth Day books were checked out when we visited our local library (like Michael Recycle, The Carrot Seed, The Berenstain Bears Don't Pollute Anymore, It's Earth Day, Little Critter, or The Whole Green World), so I just spent some time scanning the shelves. We ended up with mostly nature books, and we've combined reading with lots of playtime outside! This is a short book with beautiful illustrations and an important message about saving our forests. C has asked to read this book several times already this week. It's a great book about a boy who lives in a big city. There are no trees on his block, and when he finds an acorn on the sidewalk, he decides to plant it, and he imagines what his tree will be like. Unfortunately, it doesn't seem to be in print anymore! We borrowed this copy from the library. A great child-friendly explanation of what used to happen to our garbage, what happens now, and the importance of recycling. 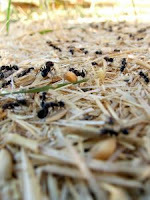 Too bad they don't talk about composting too though! Although this isn't an environmental book, it shows children all around the world and teaches you to say "peace" in many languages - certainly an important concept in preserving our planet! This one isn't a storybook like the other Fancy Nancy books; it's more of a guide to nature, with Nancy's quirkiness thrown in. It's cute, but I think C will enjoy it more when she's a bit older. Follow a boy and his father on a journey to find a lake untouched by civilization. I put a recycling symbol (or two) on every item that is recyclable in my area, and left the garbage as-is. The idea of the game is for your child to check the item for a recycling symbol, and place it in the appropriate container. I used stickers to make it easier for C to find the recycling symbol, but older children may be able to find the symbol right on the packaging. Here are a couple of books to help reinforce the concept. Of course, the best way to teach is by example, so ask your kids to help you put things in your recycling, garbage and compost bins on a daily basis! It's like the Sesame Street song: "One of these things is not like the others...". Each strip has one image that is different from the others, and C has to figure out which one it is. On the dark blue strip it's a boat with a bunch of animals, on the pink one it's a shiny heart, on the purple one, one figure has his hands down while the rest have their hands up, etc. The smiley faces are the trickiest! This was a quick and easy activity I created for C using everyday materials. All you need is scissors, paper (I used construction paper) and a bunch of different types of stickers. I also plan to laminate them with packing tape to make them more durable (and so that the stickers don't fall off!). 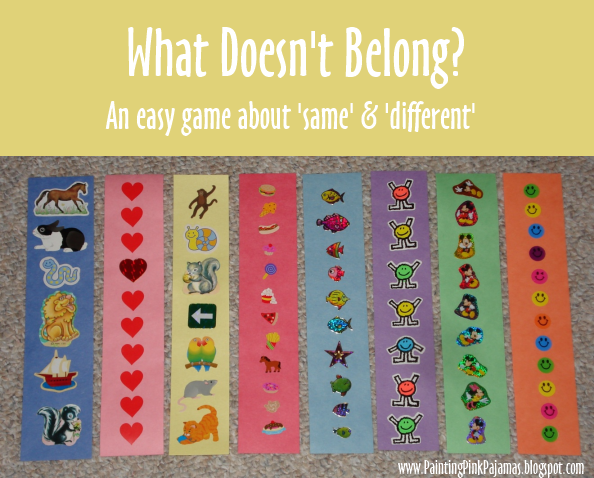 I think she'll like finding the differences, and it can also be used for counting, grouping, colour recognition... plus, it's a nice compact game to stick in my purse, just in case! This week has been a busy one at work for me! C and I have been doing a lot of general playing and spending time outside, so there's not too much to report here! C used watercolours for the first time this week, and she liked that much better than regular paint! (Oh, I later read that coffee filters are good to paint on as they soak up some of the extra moisture. Good tip - her paper was soaked!) She also tried to figure out how to use scissors, with a little bit of success. She helped me pull up twigs and leaves from the garden, and played with outdoor toys while I worked, which was fantastic. One garden down, 2 to go! 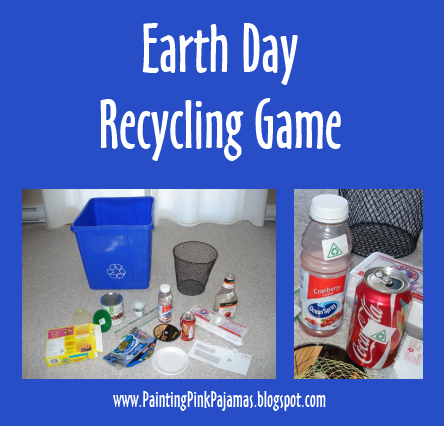 I've also been planning some of our Earth Day activities for next week. We'll be visiting the library for a kid's concert on Saturday, so I hope to go early and pick up some books. I have to work on a few more ideas for our colour Green Day, and I have a recycling game in the works that I'll post about when it's finished. There aren't any Earth Day activities for kids in our city, so we're on our own! I'd love to hear what you're doing! Celebrating Earth Day with a Toddler + an Earth Day Challenge! 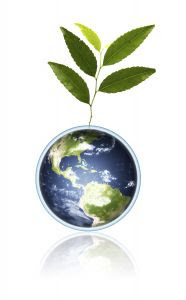 I've been brainstorming ideas to celebrate Earth Day as a family. C is two years old, and I've been jotting down age-appropriate activities and searching for books that she would enjoy. Earth Day is on Wednesday, April 22nd, but we're going to celebrate all week. I haven't heard of any child-friendly activities in our city yet, so we're making plans on our own. Have a colour day: Green! I'd like to challenge you all to celebrate Earth Day with your families; or better yet: Earth Week! Post about your plans on your blog, and then link to it here using the Mister Linky below. Then come back and link to pictures of your family celebrating Earth Day! 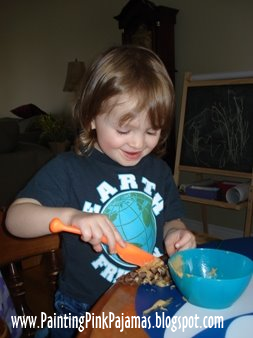 Here are a few kid-friendly Earth Day crafts from Kaboose to get you started. I'm excited to hear about all of your ideas! Please link to your POST (not just your blog). Thanks! Yesterday C played Susie Tallman's version of The Itsy Bitsy Spider over and over and over on her radio. It's a great version of the song, but like anything, it can get old, so in keeping with the theme (and to stop the song), I suggested that we make a spider craft, which C was thrilled about! The craft was super simple. I cut out a black oval, 8 short black strips, 2 white ovals for eyes, and got 2 blue circle stickers. C was very adamant that the blue stickers should not first go on the white ovals, and that was fine, so her spider just had blue eyes. Here is her finished spider. You can see where I helped with the legs! It's the night before Easter, and we finally dyed our Easter eggs! Miss C enjoyed helping to make the coloured water and drop the eggs in. Even more fun was decorating some of them with markers - she spent at least 15 minutes colouring 3 eggs! We tried using stickers on a few of the eggs to make un-dyed shapes, but water seeped under the stickers and we ended up with shapeless white blotches. Too bad! We just used water, food colouring and a splash of vinegar in each bowl. The red (pink), blue and purple dyed well, but we had to keep the yellow and green in for a couple of hours to tint them. We're not officially doing the Easter Bunny (I understand the history behind Santa Claus, but I just don't get the Easter Bunny), but we're having an egg hunt tomorrow, eating the hot cross buns that are cooking right now (why oh why did I start so late? ), and hopefully heading to church. C is normally pretty well behaved there, but it will be a long, crowded service tomorrow, so we'll play it by ear and see what her mood is like! Tomorrow night we're having some friends over for supper. I hope you enjoy the holiday with the ones you love! I've spent a lot of time this week bookmarking the fantastic children's learning activities on other people's blogs. There are so many great ideas out there! I've spent some time prepping activities for C - printing, cutting, colouring and laminating with packing tape, and the added bonus is that I can feel productive while watching/listening to TV! A lot of people blogged about the Silly Pizza Song this week, so we gave it a try. C loved it so much that we've done it 3 times already! I first read about it on Because Babies Grow Up, but check out the shape idea on If Only I Had Super Powers and the fantastic printables suggested by Princess With A Half Price Tiara. Another great idea which I prepared but haven't tried with C yet is More Mom Time's letter matching eggs. This is a great activity to help kids match upper and lower case letters. I don't have an egg-shaped cookie cutter, and I didn't want to freehand 26 eggs, so I drew a basic egg-shape in my graphics program, duplicated it, and printed a few pages. Download my file here, then draw your own letters and puzzle lines. What activities have captured your attention this week? I've been making a few crafts for C's Easter basket, and I'm almost done! Here's what I have so far: a set of beanbags, a washcloth bunny, and a secret pocket egg. C went to an Easter party today, and we got some cute crafts there. I can't take credit for any of these! Adorable bunny ears (everyone there had a set - so cute! ), a foam egg brooch, and a basket for each child. The basket is a semicircle piece of paper which C decorated. We rolled and taped it together, added a pipecleaner handle, and then went on an Easter egg hunt! After C got ready for bed, we all played with our baseball gear, coloured some baseball pictures, sang baseball songs, and finally, watched the first few pitches of the game. C was thrilled to show her hat to "the man" singing the national anthems on TV! Before bedtime, we read some baseball books: Max by Rachel Isadora and Players in Pigtails by Shana Corey. Opening Day is usually a Daddy-daughter tradition, and this year I got to join in and have lots of fun! C loves Raffi, and I'll confess, I do too! I had his records when I was a child, and we have most of them now; there is almost always one in the CD player in the living room and in the car. C wasn't a great traveler when she was little, and Raffi was the only thing that would calm her down in the car. I love his soothing voice, his mix of meaningful, traditional and classic songs, and the fact that he doesn't use gimmicks or talk down to children; he treats them with respect. I read his autobiography recently, which was very interesting (you can also download it for free on his website). Claire has never shown much interest in TV, but she recently discovered a Raffi DVD, and she's in heaven! She loves to move and groove around the basement, dancing and playing with her music box of instruments. After every song, she claps and says "Thank you Raffi! Thank you for the song!" We limit her viewing time, but it's great to see her enjoying it so much! This weekend she asked to watch the DVD, and said "Just wanna dance!" So in honour of my footloose and fancy free gal, here is her current favourite song from Raffi in Concert with the Rise and Shine Band: Shake My Sillies Out. Enjoy! Click here for a PDF of the words and musical arrangement, and visit Raffi's website for the lyrics and arrangements for many of his other songs - perfect for use in schools and at home! No, I'm not talking about my daughter's behaviour, although some days I could be! I'm so excited! 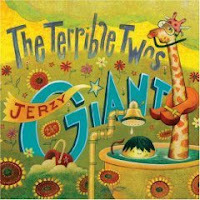 I just found out that The Terrible Twos have a new album! I'm a bit behind the times, as Jerzy the Giant was released in 2008, but it was recently added to emusic (my favourite music downloading spot). Apparently it's on iTunes too, for those of you who download your music that way. 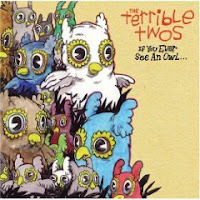 We are big fans of The Terrible Twos' album If You Ever See An Owl. They're a new breed of children's entertainers, in the same vein as Dan Zanes and Justin Roberts. The lyrics are smart, the tunes are catchy, and even though I've listened to it dozens of times, it doesn't get tiring! The only song on the album I don't like is "Pizza and chocolate milk". The sound effects in "A Rake, A Broom, A Mop, A Shovel" used to make C roar with laughter when she was a year old, and until recently she couldn't say the words "excuse me" without immediately following them with "Smickey!" and giggling. I highly recommend the album, and I'm downloading the new one as we speak! Head on over to Amazon or The Terrible Twos' MySpace Music page to hear some samples! I received a blog award yesterday! 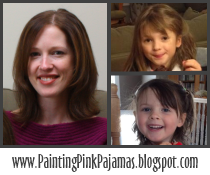 Thanks to Amber at Because Babies Grow Up! 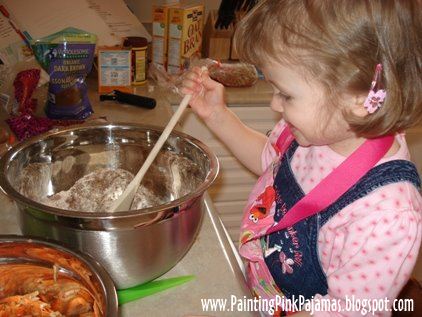 Check out her great blog for activities, songs, crafts and lots to keep your little ones busy. I visit her blog often! 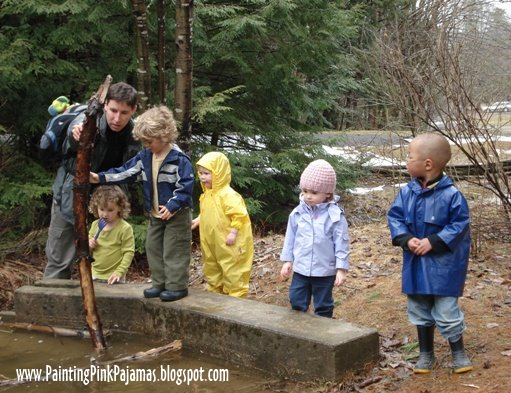 Preschool Daze - I wish my daughter could go to this preschool! I'm sure you'll find a lot of great ideas on their blogs - head on over and prepare to be inspired! I was working this morning, but C and her Daddy painted a wooden heart that he bought for her. Judging by the amount of paint on the heart and newsprint, they had a great time! C and I played with a felt board for the first time yesterday. I made it for her about a month ago, and finally took it out. She liked looking at the shapes and asking me to make things, but she wasn't really into creating scenes on the board herself. She took a liking to two brown felt circles, and wouldn't let them out of her sight! She also liked emptying and filling up the bag I had put the shapes in! Later, I labeled an empty chocolate box to put the felt shapes in. C loves that the box is gold! It was super easy to make the felt board by stretching a large piece of felt over an inexpensive art canvas and stapling it to the wood frame on the back (I think I may have gotten the canvas idea from Chasing Cheerios, but I can't find the post to link to). I've seen a lot of websites with felt board templates and I think I'll check out a few of those soon, so we can create our own stories - we mostly have a bunch of basic shapes right now. C has begun giving up her naps. She only naps a couple of days a week now, and I can never guess which days it will be. I'm so tired! It's not like I would sleep when she napped, but I miss those couple of hours of "Mommy time" to re-energize every day. I've been laying C down for "quiet time" even when she doesn't nap, and she'll play in her bed about an hour or, which is nice. Do you have any other advice about handling the end of naptime?